On the shore of Waterfowl Lake, we had our first flat of the trip. Approaching Lake Louise, we stayed a night at Mosquito Lake Hostel. 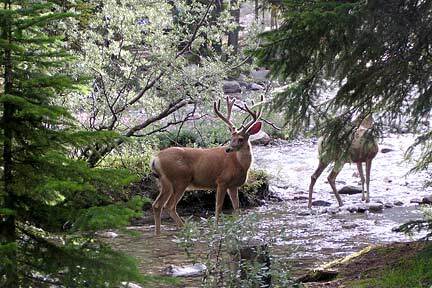 During breakfast, someone pointed out the Mule Deer outside, at Mosquito Creek. I rushed for my camera and caught the shot above. 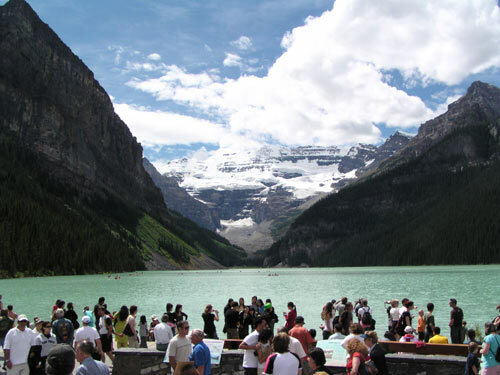 Lake Louise, above, is a beautiful place, but the number of tourists is a turn-off. There are even bleachers at one of the best viewpoints so that bus-loads of tourists can have photos taken en masse. 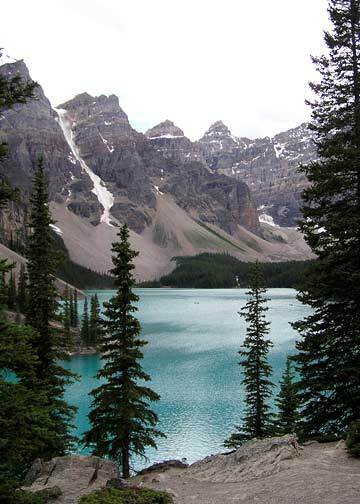 A difficult side trip to Moraine Lake, right, was more to our liking. 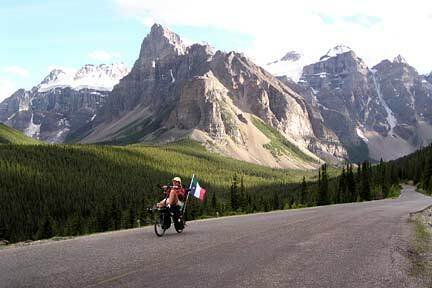 Left, Barb cycling on the Lake Moraine Road. 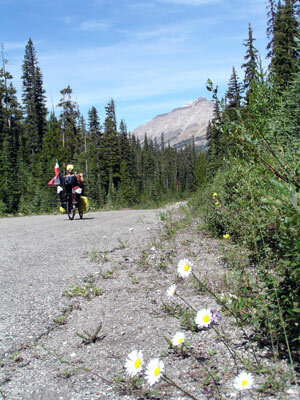 Soon we rode on the Great Divide Road, now closed to cars (below, left). 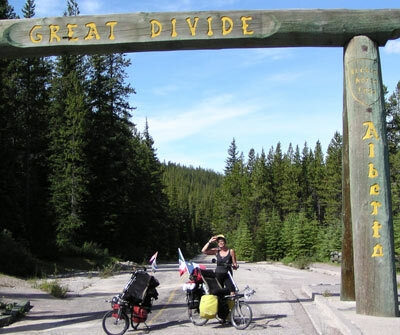 There we crossed the Great Divide for the first time, at the same time crossing the border between Alberta and British Columbia, below. 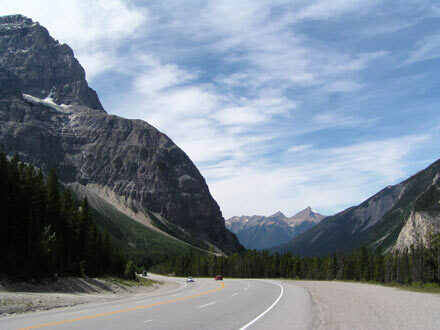 The Trans-Canada Highway (above left) goes over Kicking Horse Pass and through Yoho National Park on its way to Golden, B.C. Sometimes the traffic can be heavy, though there is usually a safe shoulder. 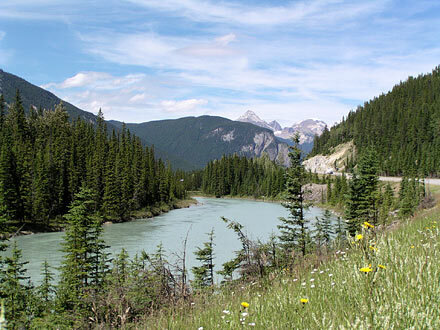 On its way down from the pass, the highway parallels the Kicking Horse River. 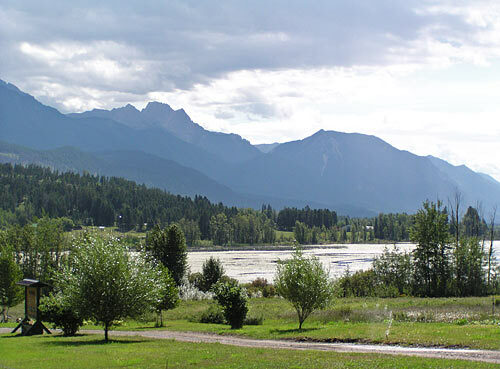 Finally it joins Route 95 in the Columbia River Valley, below — warmer, lower in elevation, and less dramatic than the Icefields Parkway, but just as beautiful in its own way.